If you have been following Misiu Academy, you might have noticed I really like interviewing Instagram people. But not the kinds with tens of thousands of followers. Real, everyday people like you and me that try to make their days (and hopefully someone else’s) better. Today’s interviewee is no different. 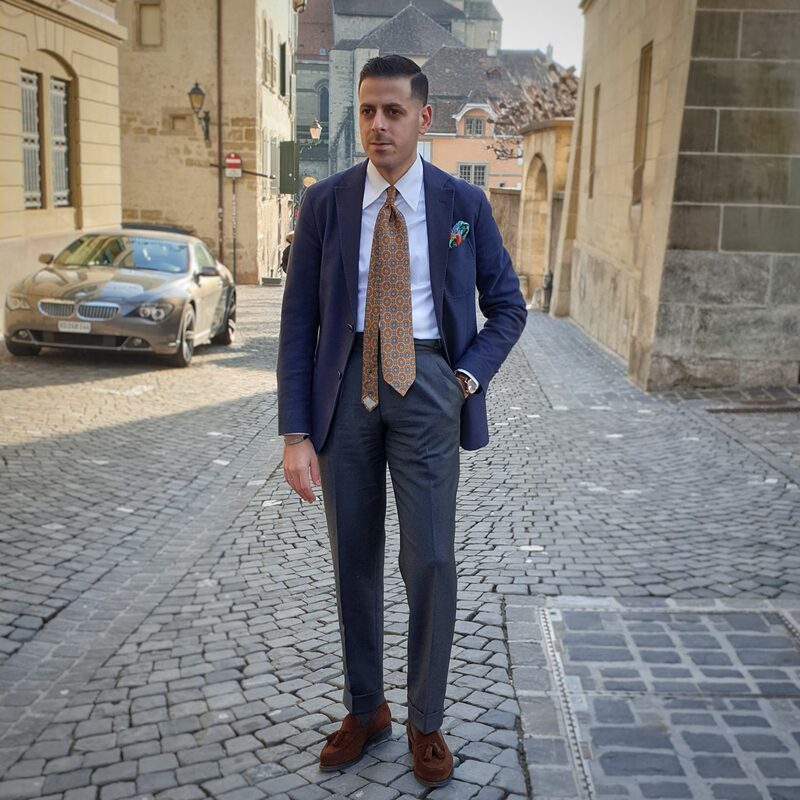 Yan Gatti (@ygatti) is a Modern Swiss Gentleman but also a rising Instagram sensation due to his sharp outfits, consistency and a touch of sprezzatura. Yan was very kind to spend some of his time answering my questions so all of you can learn a little more about him. I hope you will all enjoy reading this interview! If you like it, I suggest taking a look at Emil Levin & Philippe.Tk’s interviews since each one of them is unique. Let’s start the interview gentlemen! Hello Yan! Welcome to Misiu Academy and thank you for this opportunity! Please, tell us a bit about yourself! Hello! 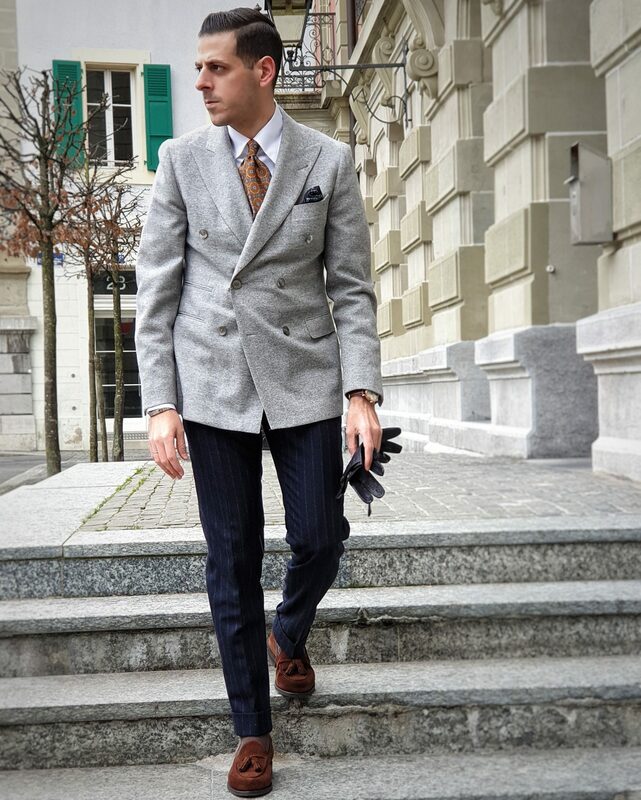 I am Yan Gatti, a general accountant in a small town called Lausanne in Switzerland. In my free time I do a lot of running and cycling. How did your Instagram journey to OOTD (outfit of the day) posts start? You post daily with great consistency! I started posting daily around one year ago. I was really fed up with my job at that time and wanted to do something different, which could potentially open some new doors. Because I don’t really have that model body type, I thought that Instagram could help. I think Instagram is a great platform for us “normal people” to express ourselves. Your followers count has steadily increased during the last year. At almost 15k followers (at the time of writing), some companies must have contacted you for collaborations right? Did you expect this when starting? Indeed, some did contact me but I mostly approached them 😅 Honestly, I never expected that and it really wasn’t in my mind. Now though, that’s another thing! Yan, for me you are the embodiment of business casual and smart casual. You blend suit separates so well! What would you say is your signature style? Thanks so much. At first I would always do a mix between jeans and formal clothes, especially skinny jeans. 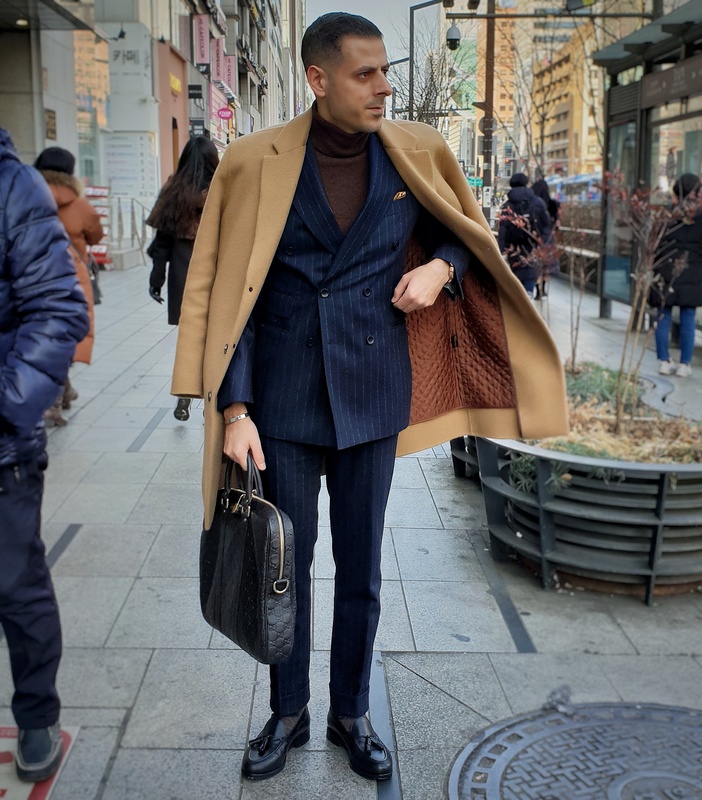 But now as my style evolved I would say a good double breasted jacket with tassel loafers are my go-to combination. Evolution is the keyword here. These days many seem to veer away from tailoring. Do you have any advice for younger people in this age of streetwear and athleisure? My advice is: Start slowly & buy the basics. Perhaps start with a jeans and jacket combination then move forward to suits. This is the essence of the minimalist wardrobe. Build the basics, learn and experiment. Talking about all this though, how did you start caring about fashion and style? Where do you draw inspiration from? It was 5 years ago in London, just seeing people dressing well. I had a rather normal style. Jeans and sneakers. But I would say my style really evolved 1 year ago. Mostly finding inspiration on Instagram. You have quite the wardrobe! Are there any favorite stores where you shop from? Any opinion on subscription services? I mostly buy in a local shop in my town called Alexander Sachs or in South Korea when I go there on holidays. As far as subscription services go, I think they are a great way to start building an accessory collection. However, I would only recommend them to someone on a budget for a few months to try different styles and then move on to better quality items. One of the things I like about you Yan is that despite your high follower count you are really down to earth, polite and engaging with everyone. Do you think it’s something that has helped your organic Instagram growth? I think yes, I try to be real and engage as much. I am not perfect so everyone can teach me something! Very well said. In fact, I get a lot of inspiration for my outfits from you. Do you realize how much of a positive influence you might have on people due to Instagram? Not really actually. I often think that my style is not that spectacular but I am really happy if I can help other guys! Time to talk about shoes! You really love tassel loafers. Is there a particular reason for that? To be honest, not really! I saw them on Instagram and just think they blend in well in all kind of formal or casual looks. Which brings me to a controversial topic for many. Socks, no-show socks or no socks at all? I am a no show socks guy in summer and spring! What does being a gentleman mean for you in 2019? I would say having good manners, respecting everyone and of course try to help fellow guys improve their style! Respect and good manners are essential in my opinion. Culture and upbringing plays a big role. Speaking about this, do you have any hobbies or passions apart from classic menswear? Cycling and running take most of my time. In fact, I usually train a minimum 5 times per week. Yan, it has been a pleasure. Any last words you want to share with your followers? I want to thank everyone that follows and comments on my posts! I will always also be open to all suggestions. It’s a big journey and I want to keep improving my content. Thank you for having me here! What impresses me a lot is the consistency that Yan has. He hardly misses a day with new fresh content. In general, I see that he is more of a suit separates rather than a full suit kind of person. From time to time you will see him rocking his signature blue or gray double breasted suits. He loves flannel as much as I do too! 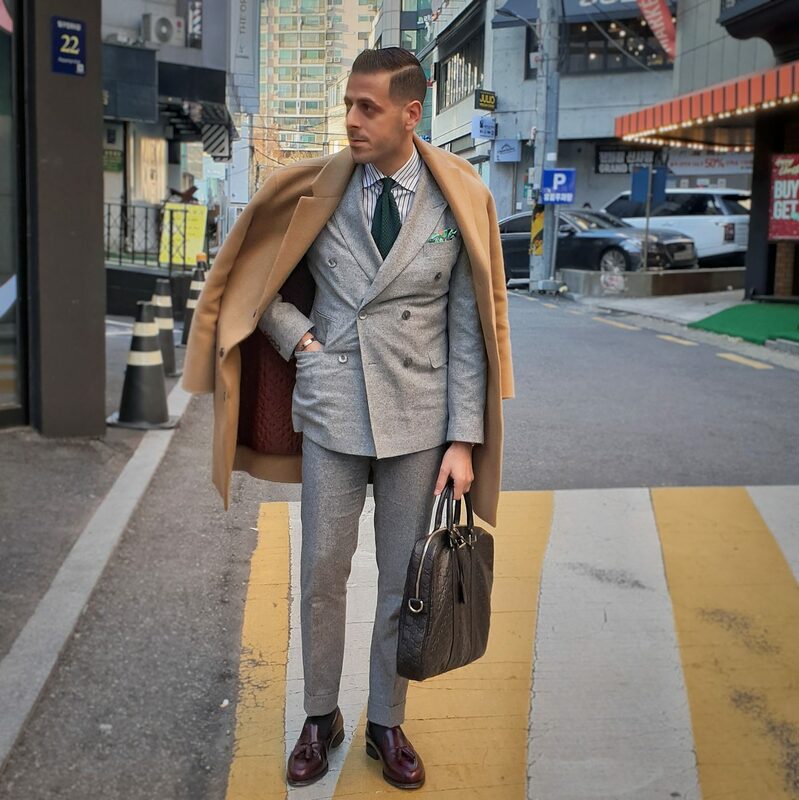 Another trusty companion is his camel coat, which is an excellent versatile choice that is surging in popularity. If there is something that truly characterizes Yan though is his love for tassel loafers in both Calf and Suede. I think they are an excellent choice for spring, summer and even autumn. Living in a cold country like Sweden though…I do not feel comfortable wearing short socks. It is a choice though, your choice and don’t let anyone tell you otherwise. What I find very interesting is his use of cardigans. Cardigans are a wonderful addition to your wardrobe but truth be said, the wrong choice would make you look like a grandpa. Yan uses a lot of plain color cardigans with the odd knitted colorful version. It works very well on him, but it does not mean it will on you. The moral? Experiment! A lot of emphasis goes on the ties and the pocket squares. You can also see a bit of sprezzatura by the way the short end of the tie hangs outside. Lastly, a thing to remember is that Yan knows his angles. He frequently changes backgrounds, but most he knows his best angles. This comes with experience, trial and error but is quite important for those you that aspire being the next Instagram sensations. This brings us to the end of this shorter interview with Yan Gatti. A really nice Swiss gentleman and a master of business casual. It might have been a little underwhelming if you compare it to the previous ones, but I promise it is worth taking a look at his Instagram for inspiration. 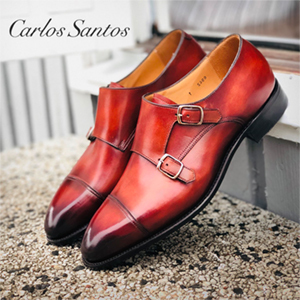 The next article will be about a beautiful pair of Carlos Santos Derbies and I will also be enjoying a week in beautiful Warsaw! In the meantime, why don’t you live a comment about what could Yan improve or does right?